Synthesized peptide derived from the C-terminal region of human A Cyclase V/VI. Small volumes of anti-Adcy5 antibody vial(s) may occasionally become entrapped in the seal of the product vial during shipment and storage. If necessary, briefly centrifuge the vial on a tabletop centrifuge to dislodge any liquid in the container`s cap. Certain products may require to ship with dry ice and additional dry ice fee may apply. 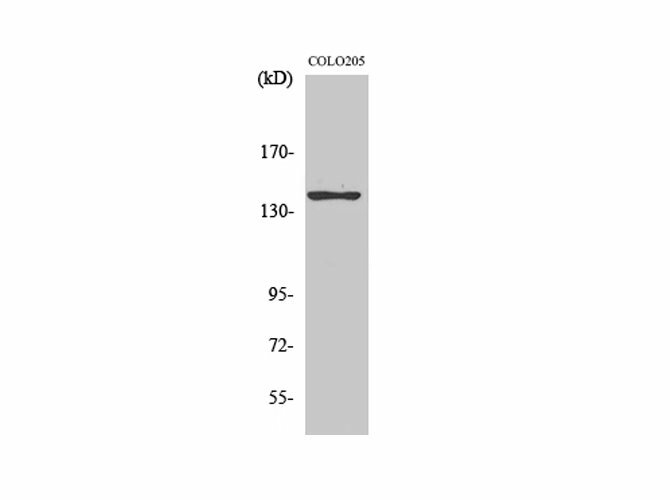 Western Blot analysis of COLO205 cells with A Cyclase V/VI Polyclonal Antibody. NCBI/Uniprot data below describe general gene information for Adcy5. It may not necessarily be applicable to this product. Catalyzes the formation of the signaling molecule cAMP in response to G-protein signaling (PubMed:1409703). Mediates signaling downstream of ADRB1. Regulates the increase of free cytosolic Ca2+ in response to increased blood glucose levels and contributes to the regulation of Ca2+-dependent insulin secretion. 1. Increased expression of adenylyl cyclases V and VI is a major determinant of increased GABAergic transmission in the substantia nigra pars reticulata of animals in which L-DOPA induces severe dyskinesia.